Uncommon™ Telescoping Flagpole 16'-25' - Call For Special Pricing | Flagpoles Etc. his new and improved version is brighter than ever before, will beautifully illuminate a flag measuring up to 4'x6', and now fits with any of our eagle flagpole finials! This eagle has an 11.5" wingspan and measures 12" from top of wing to bottom of bolt. Uncommon™ Base Collar, For Flagpoles 2.25"
A base collar is not only a decorative cover for the ground sleeve but also covers the locking clamp that holds your telescoping flagpole in place (Anti-Theft). The cover plate is 12" in diameter and is made of aluminum. This is Wonderful addition to your Uncommon telescoping flagpole. This is for a Flagpole that has a bottom section diameter of 2.25"
Uncommon™ Base Collar, For Flagpoles 2.5"
This is for a Flagpole that has a bottom section diameter of 2.5"
Uncommon™ Base Collar, For Flagpoles 3"
This is for a Flagpole that has a bottom section diameter of 3"
Hitch Mount for Uncommon™ Flagpoles 2.25", 2.5"
This Uncommon™ hitch mount is designed to securely hold your flagpole on a hitch. This product only works with the Original series and Presidential series flagpoles. This hitch mount will fit bottom diameters of 2.25", 2.5. Hitch Mount for Uncommon™ Flagpoles 3"
This Uncommon™ hitch mount is designed to securely hold your flagpole on a hitch. This product only works with the Heavy Duty poles. This hitch mount will fit bottom diameters of 3"
15 feet high (will fit a 16' or 20' pole) with super bright LED lighting technology. No need to replace bulbs (100,000 hours of usage).
. 389 multicolor LED lights (red, green, blue and yellow). Low voltage for energy efficiency is safe and the lights do not produce heat. Sturdy metal construction with powder coat finish. Simple and easy to setup and detach, and super compact for storage and shipping.. Outdoor UL listed AC adaptor. Uncommon™ Horizontal Dock Mount 2.25" 2.5"
The Uncommon™ flat dock mount is designed to fit poles with a 2.25" and 2.5" bottom diameter. Uncommon™ Horizontal Dock Mount 3"
The Uncommon™ flat dock mount is designed to fit poles with a 3" bottom diameter. Uncommon TM Vertical Dock Mount/ Wall Mount for 2.25" 2.5"
This mount is designed to hold your Uncommon™ Original and Presidential flag poles design for poles with a bottom diameter of 2.25", 2.5". Uncommon TM Vertical Dock Mount/Wall Mount for 3"
This mount is designed to hold your Uncommon™ flagpole with a bottom diameter of 3". Wheel Stand for Uncommon™ Flagpoles for 2.25" or 2.5"
This item will fit a Uncommon™ flagpole with a base diameter of 2.25", or 2.5"
Wheel Stand for Uncommon™ Flagpoles for 3"
This item will fit a Uncommon™ flagpole with a base diameter of 3"
Demanding the best when it comes to telescoping flagpoles means insisting on an original Uncommon™ Telescoping Flagpole. These unique and top quality telescoping flag poles are portable and can be extended and locked in mere seconds. The anodized finish and 16 gauge construction assures customers that these flagpoles are built to last. For even further assurance, each Uncommon™ Telescoping Flagpole comes with an impressive 10 year warranty and 90 day satisfaction guarantee. 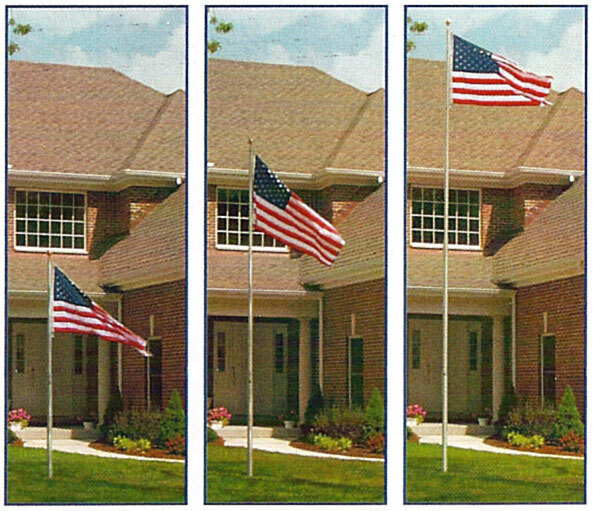 Uncommon™ Telescoping Flagpoles are available in 16’ to 25’ heights. satisfaction guarantee.It is constuctedof 16 gauge with uniques polycarbonate bushings allowing each section to slide up and down smoothly "metal never touches metal" Its pvc ground sleeve has looking capabilities to prevent theft. only flagpole to offer theft replacement. and manufacturing will replace it.